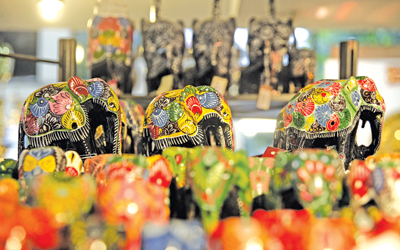 The Laksala Handicraft Emporium is exploring possibilities into setting up a micro finance institution next year. Chairman Laksala, Anil Koswatte said this is mainly to assist their suppliers to re infuse capital to their business. By doing this they would be able to manufacture better products and have access to better technology. This will in return bring them better yields,Koswatte said. Today Laksala after going through a major restructuring process, there are more that 5000 artisans, craftsmen and suppliers registered with Laksala from across the Island. All these suppliers get paid immediately or within 14 days of supplying goods to Laksala. Laksala has also taken upon itself to educate and guide these suppliers on new product development and takes a keen interest on accustoming them towards emerging international standards for gifts and souvenirs so that they become highly competitive and economically viable entrepreneurs amidst intense global competition. Under the forward vision of Laksala, the supplier base will be increased upto 15,000 in the next few years. He said that today their suppliers are already making bigger profits and their ultimate aim is to make them self sustaining entrepreneurs where they would have their own retail and wholesale shops. Another area the management hopes to diversify is the leisure sector. He said that they are keen to manage a hotel operated by a state institution. We would also have our products in these proposed hotels. “We are also determined to venture into the South Asian region in general and India in particular. We are also looking at China, which is a growing market. In addition, we have got many inquiries even from European countries,” he said. He said that in addition Laksala will also go for a listing in the Colombo Stock Exchange. With the objective of popularizing and promoting the Sri Lankan handicraft industry both locally and globally, Laksala was inaugurated in 1964 by the then Prime Minister Sirimavo Bandaranaike with an investment of Rs. 2.5 million at their building in Fort.